The Crown Jewels, which I wrote about last time, are kept on display in the Tower of London. To see them, you pass through a doorway with open “doors” that look incredibly secure, like a bank vault, and I guess the rooms themselves are a very large walk-in vault. Yeoman Warders, nicknamed Beefeaters, keep an eye on you and the glass-encased jewels. The Yeoman Warders give tours and look great in vacation photos, but they have other, more serious, responsibilities. All have had a distinguished military career that meets certain requirements necessary to become a Yeoman Warder. Living in flats in the tower complex with their spouses and children, their duties are security and visitor safety in addition to shifts giving tours. One of the Yeoman Warders is a woman. Yeoman Warder at the Tower of London. Photo by Arpingstone. 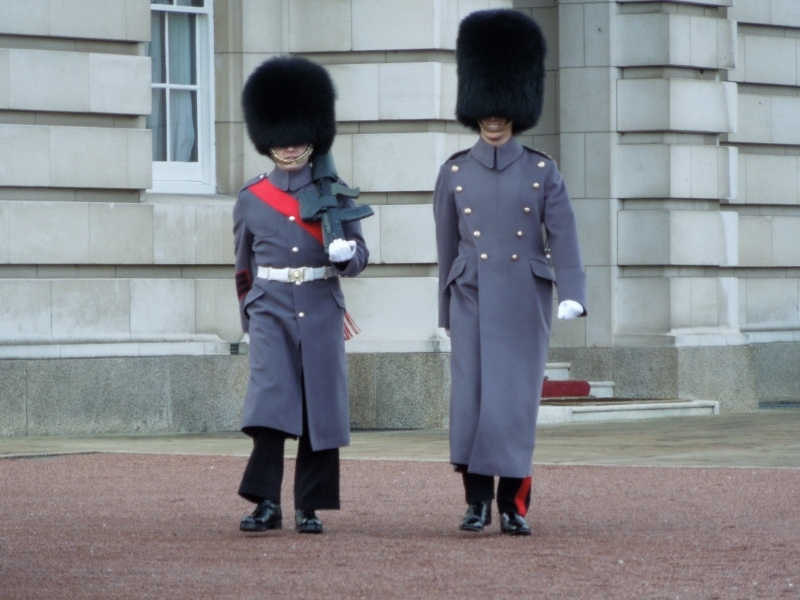 Guards, such as these at Buckingham Palace, also protect the Crown Jewels at the Tower. 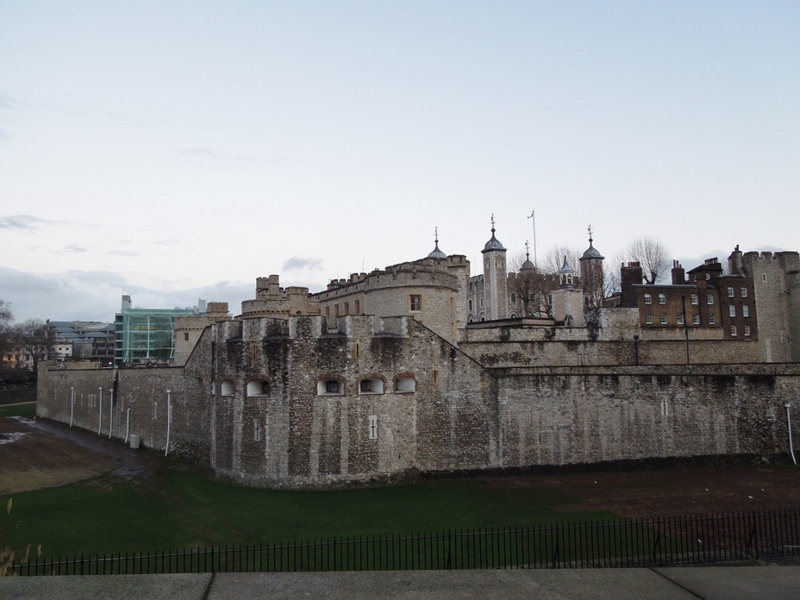 The White Tower was built by William the Conqueror and was completed by the year 1100. 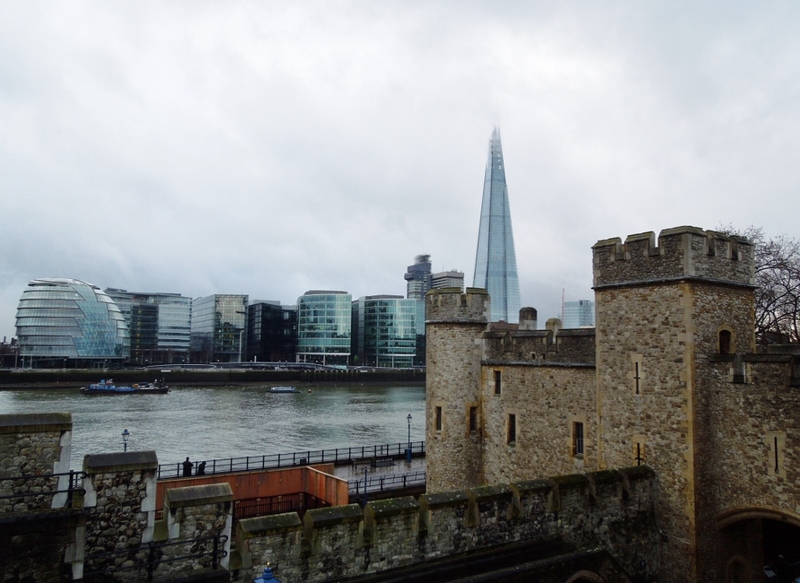 The photos above and below show the walled complex, much of it medieval, in the heart of a 21st century city with many modern buildings. What fun to suddenly come upon something you’ve never seen, yet it’s familiar. 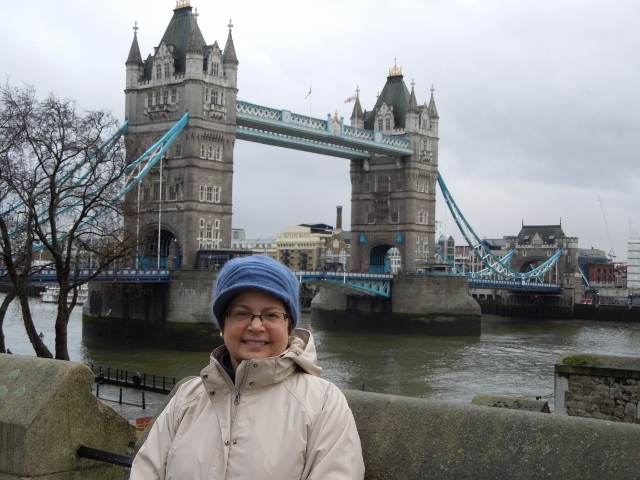 Me at the Tower Bridge. Here’s a link to a YouTube video by Historic Royal Palaces, about the Line of Kings (click on those words), showing royal armor and more on display at the Tower, and how and why this exhibit has changed over the centuries. You look like you’re having fun! That Line of Kings video is great, thank you. I remember seeing Henry VIII’s armor–am I crazy or did he have a very large, er, cup? Probably for his pride. Ha, ha. I Googled this. (I missed the Line of Kings, arriving late in the day.) It turns out that part of armor is called a codpiece and was part of men’s everyday fashions. Wikipedia cites a book about Henry’s armor bulge: http://en.wikipedia.org/wiki/Codpiece. I haven’t read the article but I think the man had quite an ego! You were probably on the money when you guessed his armor’s big bulge was due to pride. The article says: “And then there are the codpieces, which can best be described as roomy. ‘I think the king’s codpiece also had to stand out a bit more than the common herd,’ said the keeper of armour, Thom Richardson.” Thanks for the link. Only yesterday I was blissfully unaware of codpieces.